Scientists report (see AAAS report, Wired article or actual research) that they are now able to refract or focus gamma rays. Contrary to theory, they have discovered that gamma rays can be deflected by the nucleus of a silicon atom. Down a bit in the article they said that the mystery deflecting gamma rays seems to be the creation of “virtual electron” electron&anti-electron pairs in the nucleus. The deflection is something ~1.000000001 not much yet, but the belief is that even heavier elements such as gold will refract gamma rays even better. Gamma-ray and gamma ray bursts are typically evidence of extremely energetic explosions witnessed in distant galaxies. They are the most luminous electromagnetic events in the universe. 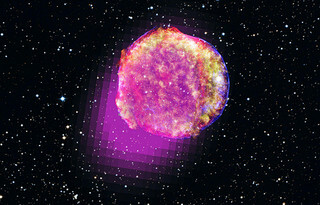 Most gamma ray bursts are released during supernova explosions when a star violently collapses. But what can you do with Gamma ray optics? The possibility of gamma ray optical systems introduces a whole new way of looking at the universe. For example, the introduction of x-rays in the early 1900s created an entirely new way to see inside the human body, never before possible. It’s unclear what gamma ray optics or a G-ray machine will do for medicine or human health but it’s certain that such devices will be better able to “see” processes and objects impossible to detect today. One item of interest was the promise that someday, gamma ray optics will be able to render harmless, radioactive isotopes such as nuclear waste. Somehow a focused gamma ray beam at the proper (neutron binding energy) wavelength could be used to “evaporate” or remove neutrons from an atomic nucleus and by doing so render it less lethal. How this works on Kg of material versus a single atom is another question. Also, gamma ray optics could be used in the future to potentially create designer radioactive isotopes for medical diagnostics and therapy. Even higher resolution nuclear spectroscopy is envisioned by using gamma ray optics. I don’t know about nuclear waste, but if gamma ray optics could transmute lead into gold, we might have something. This probably means that someday, gamma ray optics will be able to store information in an atomic nucleus and that would certainly take data density out of the magnetic domain altogether.